Codefest 2017 raises record-breaking total for charity! We’re delighted to announce that Codestone has raised over £8,000 for charity through our sixth annual ‘Codefest’ charity music festival, the highest total the event has raised to date. Organised and paid for exclusively by Codestone just for our 105 staff members, their family and friends, Codefest is a not-for-profit weekend-long festival featuring local bands, plus locally-sourced food and drink and children’s entertainment. Rather than selling tickets, we simply ask employees to make a charity contribution as the cost of their admission. Codefest takes place at Longthorns Farm campsite near Wareham, which generously lends its site to the event in support of our two chosen charities. Julia’s House, which will receive 70 percent of the £8,016.25 raised, is a children’s hospice charity based in Dorset and Wiltshire. The remaining 30 percent will go to Project Luangwa, an education sponsorship programme in Zambia. 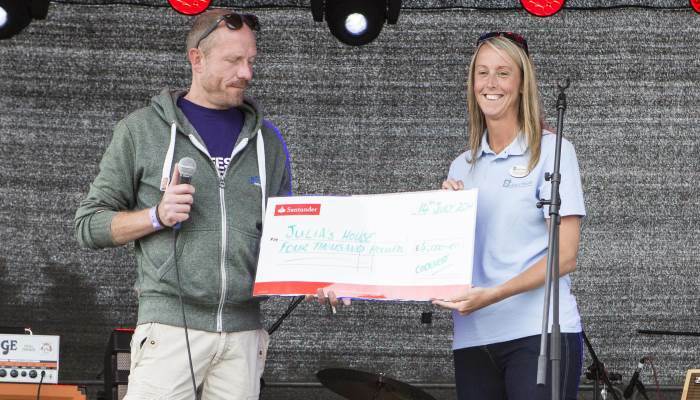 Since the first Codefest festival in 2012, we’ve raised over £30,000 in total for these two charities. As well as generating invaluable funds for charity, Codefest acts as a hugely anticipated reward for our team and offers an opportunity for directors, management and staff to enjoy a relaxing family weekend away from work. This year’s event headliners, Coldplay tribute act Viva la Coldplay and International Gatsby party band, were joined by a full line-up of local bands and artists. Food and drink vendors, as well as providers of the craft tents, face painting, henna tattoos and bouncy castles, were all chosen for their local credentials. Chairman and CEO, Jeremy Bucknell, says, “Now in its sixth year, Codefest has become a real passion for our team, one of the highlights of summer and tickets go quicker and quicker each year. The ethos is simple, whilst we’re very passionate about what we do at Codestone, every now and then you need to get back to basics – switch off, kick back and relax with your people. “It’s really important to us that Codefest supports businesses in the Dorset area,” says People and Payroll Assistant Caroline Downing, who manages the organisation of our annual festival. The music festival isn’t the only way we support our staff in charitable giving. Every member of the team is given a yearly sponsorship allowance by the company, which they can put towards personal fundraising projects such as running a marathon or completing a cycling challenge.